As you know, the typical 3” diecast model is considered to be 1/64th-scale (more or less). 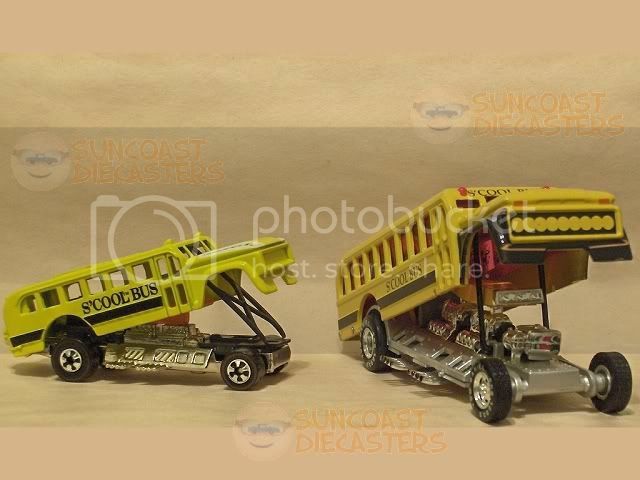 Occasionally a particular vehicle model, already seen in 1/64, will show up in a larger scale at Suncoast Diecasters meetings. Personally I consider it fun to do a photo comparison of the different scales. 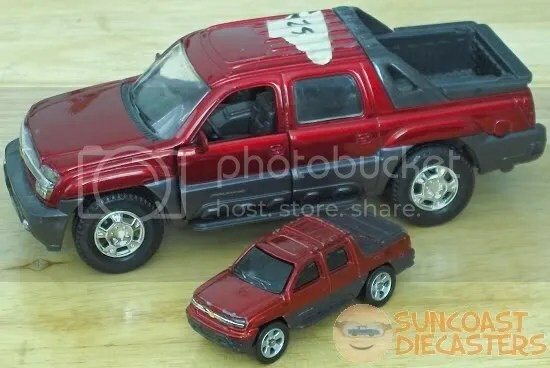 In this first photo we see the 2002 Chevrolet Avalanche. The 1/64 is by Maisto; the 1/24 is by NewRay. I had seen the Maisto in Ed’s collection, but ignored it as I generally do not collect modern vehicles such as SUVs and crossovers. However, at the White Elephant booth of a local church carnival I spotted the NewRay. It was in good condition (just needed a little glue on the front fender), and for 25¢ I couldn’t pass up the opportunity to pair it with Ed’s, if he still had it. The Lord smiled on me: I purchased the Maisto from Ed at our July ’11 meeting. Upon getting home and doing a visual comparison, I was pleasantly surprised to find that, except for the “toy-like” wheels and lack of side mirrors (and of course a simpler baseplate), the Maisto matched the NewRay detail for detail quite nicely. Tom Daniel’s S’Cool Bus. 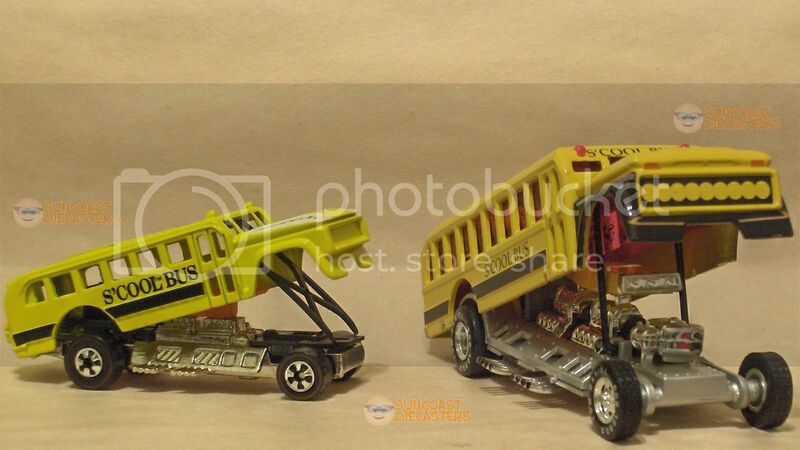 The 1/64 is the Hot Wheels Vintage re-issue, the 1/43 is by Toy Zone. At our September 2011 meeting, Jim had the big bus amongst his sellables. I had purchase several other TD models in this line, but I had never seen the Bus at the stores. Jim’s asking price was barely above the original peg price (thank you, Lord! ), so I readily snapped it up. Unlike the Avalanche above, the two Bus models do not compare so well on details. For example, the Toy Zone model has nine windows on its passenger side, while the Mattel has only six. Also, there’s some structure just in front of the engines on the TZ which is missing from the Mattel (although this probably has to do with making room to attach the body lifts). But if one does not zero in on the details, the two models are quite presentable together. Download a larger version from the choices below. Hello I’m Jeff my mother got me into the middle model car club I would get a model to build every month in the mail and the s’cool bus was one of the models I received and it came with a hot wheels s’cool bus this was in 1971 I got a few modules models with the matching hot wheels diecast cars where can I find a s’cool bus model with matching diecast bus ? With out paying a whole lot of money for it . Hi, Jeff, good to hear from you. My mom signed me up for a “model of the month” club too. Wasn’t in it very long, so I didn’t get a lot of models. However, I don’t recall mine including a diecast. I haven’t seen anything online about the model-with-car kits being available. You might do well to check model collector sites and message boards. You can order the S’cool Bus model (signed!) directly from Tom Daniel’s site, but it doesn’t include the diecast. You can find the diecast on club sites and auction sites; depending on condition and packaging, the cast will vary greatly.